I was away at the weekend. I went down to my parents on the south coast, and, since the place is so car-centric that some form of wheeled transport is almost essential, I took my new bike (which is, I have to say, much easier to get on and off trains than Zephirine, if slightly less characterful and not as comfy a ride). The weekend was fine. I finished a sewing project. Dad’s a lot better than he was at Christmas. I loaded the bike up, cycled to the station, slung her on the train (that sign says “space for three bicycles,” not “space for your ridiculously-oversized suitcases,” so don’t get sniffy with me when I move them), and headed home from Waterloo to Rosamundi Towers via the South Bank, walking over the Millennium Bridge and round St Paul’s. CycleStreets suggested I use Blackfriars, but the redesign has given me the fear and figuring out a strange junction in the dark when I’m tired didn’t strike me as the best idea I’ve ever had. The two punishment passes were because I was riding out of the door zone past a line of parked cars. The first instance was because the mini cab firms along the Mile End Road think that a cycle lane on a red route is the perfect place to park their cars on a Sunday evening. The second instance was because one of the new build blocks of flats near Bow Interchange was built with inadequate car parking so everyone parks on the street in the cycle lane. Quite what was stopping the first car moving into the empty second lane and overtaking from there, I do not know. Another driver seemed to think that “having cars parked in it,” is no excuse for me to be out of the cycle lane, but he just contented himself with hooting and shouting something unintelligible as he passed. The obscene suggestion just made me giggle because after cycling from Waterloo to Stepney, I can’t imagine I’d have been the most fragrant of companions. Still, takes all sorts. So, yes, good question. How do I put up with it? And, possibly more to the point, why do I put up with it? Why do I put up with cycle infrastructure which is trumpeted as an improvement, but which has, in fact, made it worse for cyclists? My choice of transport genuinely worries people. Dad did a proper dad panic when he read about the female cyclist killed at Bow. She was my age, she wasn’t named in any of the reports, and because I was on the Tour du Danger when he read about it, he couldn’t get hold of me all day. Some people on Twitter are quietly relieved when I check in of an evening. Yes, I’m saving £100 a month in tube fares and about £30 a month in gym membership that I’d never use. Even with the costs of servicing, and buying decent-quality kit so I’m not tempted to take the tube on days when the weather is being spiteful, I’m over £1,000 ahead in a year. I can carry more shopping on a bike than I can on foot. Most days, I enjoy my riding my bike. The miles rolling away under the bike’s wheels to the steady rhythm of the pedals. Knowing that I can change my route if I want to. The freedom to visit places which are not on sensible public transport routes, and not being dependent on the goodwill of others in areas which are not well served by public transport. But the actions of others do make it less pleasant than it needs to be. Dangerous close passes by drivers and other illegal manoeuvres that put me at needless risk. Cycle infrastructure that could have been so much better than it is. Deciding that “no, I’ll not use that route today,” because I have to make the choice between dangerous-but-well-lit and quieter-but-too-dark-to-be-safe. Having to assess every group of males for possible menace. Taking flak for every cyclist that runs red lights or goes the wrong way down one way streets or rides in the dark without lights on, no matter how much I protest that I don’t do those things. Currently, the answer is “Yes, it’s still worth it. No. I’ll not fill out the loan application.” Will the next testosterone-fuelled comment, the next carelessly disposed of cigarette that is flung at me from the pavement or a car window, the next “all cyclists are hooligans,” the next punishment pass be the last straw? I know that if I stop, there will be one less female cyclist on the streets of London. We are already under-represented. The percentage of people who cycle in London is already low, and whilst 50% of the population is female, only 25% of cyclists are female. Is my presence encouraging others to make that step? Do I add to the “safety in numbers,” that might be the tipping point to get more people cycling? Am I prepared to put up with all this for much longer pour encourager les autres? And it gave me the rage, it really did. Then explain to me why a cycle lane and Advanced Stop Lane are almost identical in size and shape to a lorry’s blind spot? Explain to me why lorries and cars ignore advance stop boxes, up to and including manoeuvring themselves illegally so that although you weren’t in their blind spot when you arrived at the lights, you suddenly are? So when they run over your head they know what it looked like before it had a close encounter with your wheels? I have made eye contact with drivers, and they turned left directly in front of me anyway. They did a close overtake and then cut in front of me anyway. OK, I’ll give you that one. I despise cyclists who think that the rules of the road don’t apply to them. I also think pedestrians who step out without looking are idiots, and words cannot express my contempt for people who use the baby in the buggy as the road-crossing equivalent of the canary in the mineshaft (if the baby is hit by a speeding car, find somewhere else to cross, this clearly isn’t safe). But equally, I see car drivers running red lights all the time. I see them accelerating up to traffic lights and skimming through on “dark amber.” I see them encroaching on Advanced Stop Lanes which are supposed to be for cyclists only. I see and hear them revving their engines at zebra crossings. I see them on their mobiles, applying makeup (I hope you poke yourself in the eye with your mascara wand), picking their nose, singing along to the radio, having a row with their passenger, squinting at their satnav. Distractions whist driving a car are far more dangerous to vulnerable road users. Then please explain to me why every single cycle lane I’ve ever used in London places cyclists firmly in the door zone? And if I cycle outside of the cycle lane, in order to avoid being doored, I get hooted at and sworn at by drivers who are outraged that I dare to hold them up. From the wording of the e-mail, they are also writing to drivers. I’d be interested to see that e-mail, I really would. It’s a bit, um, weaselly, isn’t it? We are reminding drivers to give space to cyclists when overtaking and at junctions. But hey, if you forget, never mind, eh? Accidents happen. Please. Pretty please. Pretty please with cherries on top, or we’ll cry. and check before you open your door as they can be hard to spot. Those pesky cyclists, eh. They’re hard to spot, so if you hit one, it’s got to be their fault for being invisible in a public place. Yes “make eye contact with drivers.” Because that works so well when they’re fiddling with their radio or squinting at their satnav or putting their makeup on or picking their nose, or doing anything apart from paying attention to the road ahead. Have you ever tried making eye contact with a driver who’s looking everywhere but at you? ensure they follow the Highway Code when cycling. Well, actually, we’re just telling them not to run through red lights. 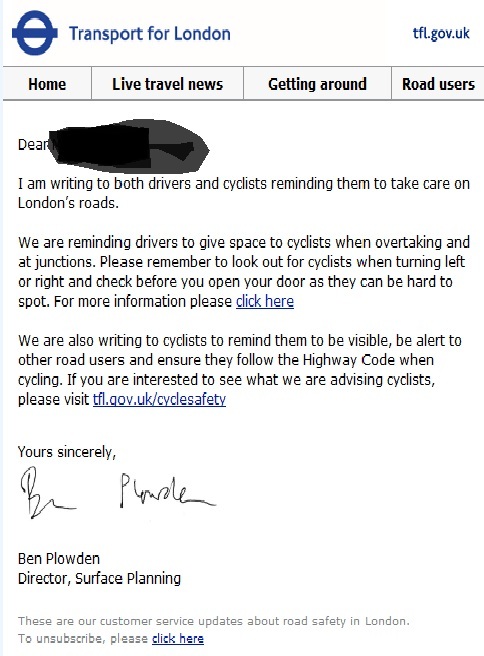 There is nothing in this letter about being a careful and considerate road user. Nothing about paying attention to the road, keeping out of Advance Stop Lanes, or not picking your nose at the traffic lights (seriously, please stop doing that, it’s unspeakable). There’s a dollop of victim blaming, a vague request to look out for cyclists, and an implication that the only people who need to obey the Highway Code are cyclists, not car drivers. Sending out two separate e-mails smacks of divide-and-rule, us-and-them. No sense of us all being road users together, that if we try and get on then everyone’s journey will be pleasanter. There is a little girl who lives on the estate. She’s, dunno, five? Something like that. She has a bike. It’s pink, and has streamers on the handlebars, and a little basket on the front. I quite often see her bimbling about the place, doll in basket. She and I have had variations on this conversation several times, the latest being this evening. I was down by the shed, doing a very minor bit of fiddling with Felicity, my other bike, the one with dérailleur gears and a foam saddle, that I bought as a slightly more sensible alternative to doing the Nightrider on Zephirine. It only came fitted with front and rear reflectors, not lights, so I have been meaning to replace the rear reflector with a bracket and a light since, oooh, September. Anything to put off writing my essay about the Chartists, I trotted off to the shed with spanner and light bracket, and set to work. A look of utter shock crossed her face. [Choking noise, mostly directed at bike’s back wheel]. Clearly, I have a defective daddy, who bought me a toolkit and what I persist in calling “The Bumper Book of DIY for Girls,” instead of arranging his life so he is constantly on standby to do up a couple of bolts on his daughter’s bike. Now, I’m not saying that a five-year-old should be able to strip down and reassemble a hub gear, or even know how to fix a puncture, but she won’t be five for ever, and, please God, Transport for London will one day pull its finger out and fix the roads in London. She will, hopefully, then discover that there is a world out there that is a lot more accessible on a bike, and so she won’t be within the reach of her dad/brother/husband/second-cousin-twice-removed to fix her punctures. So don’t teach your girls (or your boys, for that matter), that daddy will always be around to fix a puncture or change a light bracket or fix a slack gear cable, because what is she going to do when daddy, packing for his ski trip, falls down the stairs and breaks his leg in three places? The fact that I was doing this minor bit of fettling in knee-high boots with three-inch heels, a dress, and a pink fleece jacket is entirely irrelevant. @TfLofficial tweeted: “TfL announce design proposals to further improve cycle safety at Bow roundabout http://tinyurl.com/86n8sde #cyclesafety” on 12th January. I’m sure it was the merest slip of the finger that stopped them typing “TfL announce design proposals which will make a start on cycle safety at Bow roundabout,” but there we are. If nobody died in the five years before you started messing about with a junction, and then two people die in the space of three weeks, it’s a fairly safe bet that your much-vaunted “safer, faster and more direct” route has made it worse. I’ve had a look at TfL’s design proposals. From the point of view of a utility cyclist, someone who ambles off to work or the shops or the park or her mate’s with a pair of leggings on under her skirt as her only concession to “cycle clothing” (well, it doesn’t do to show the neighbours one’s knickers), I’m not impressed at all. Dedicated how? The PDF says “mandatory cycle lanes,” but there’s no indication of a physical barrier between the lanes. That’s got to be a pretty thick layer of paint to stop a lorry driving in it. In my experience of cycling in London, the only time a non-segregated, mandatory cycle lane is actually mandatory is when there’s a police cyclist in full, eye-bleeding hi-viz in it. To get onto the flyover from the westbound lane you have to go across at least one lane of fast-moving, heavy traffic. TfL is therefore proposing to put a crossing in to enable cyclists to access the flyover at both ends. Surely this will just move delays at the junction (which TfL appear to fear more than anything else in the whole world ever), back to the start of the flyover? Correct me if I’m wrong, but this really doesn’t look like a dedicated green phase for cyclists that allows them to travel ahead of other traffic. It just looks like a dedicated green light that lets them into the advance stop box, where they’re held on red and then cyclists and other traffic just go for it like usual. You still have to hope that the car or lorry behind you isn’t in such a rush to turn left that they don’t wait until you’re safely past before turning. If cars are on green while I’m held on red, this seems to be inherently dangerous unless cyclists are segregated from motor vehicles in some way – a careless turn from a car driver and I could be under their wheels. It looks to me that the cycle lane is only segregated for part of the way leading up to the junction. the protection can’t be continuous because there is a side road on the left and a bus stop. You’ve still got to negotiate your way through the traffic to get to the dedicated green phase and the Advanced Stop Box. Cars coming out of the side street creep into the cycle lane. Unless the cycle lane is properly segregated from traffic, it will not provide additional safety for cyclists because it will still be shared with motor vehicles. I’d also be interested to see the junction timings, to see who will have priority, cyclists or motor vehicles? Heading west, Cycle SuperDeathway 2 still spits you out down the Mile End Road into a “cycle lane” which has got car parking spaces in it, and heading east, it drops you with no guidance, not even an advisory cycle lane, into a road which is three lanes of fast-moving traffic each way. Not impressed, TfL. Fine words but no actual, concrete changes. If you had bitten the bullet, accepted that prioritising the motor car in London is a damn silly idea, and gone for this I’d have cheered you to the rooftops. But no. You’ve gone for the grand gesture which, on first sight, pays lip-service to the idea of cyclist safety but doesn’t actually do anything, and still makes no provision for pedestrians to get safely across the junction. The Highway Authority for the Bow Roundabout Flyover and the road immediately to the east of the roundabout (Stratford High Street) is the London Borough of Newham. TfL has commenced discussions with Newham to seek approval where changes to accommodate these options may be required on their roads. Good luck with that. Mayor Wales is the reason cycleSuperdeathway 2 stops at the roundabout and doesn’t go into Newham. He is vehemently anti-cyclist and this attitude pervades all of Newham council. You can’t “discuss” anything with a man who thinks the convenience of him and his deputy being able to park their cars closest to the lifts at the council offices fully justifies the removal of two disabled parking bays. I learned to drive in a fairly rural area, where the biggest hazard is ponies dozing in the shade under a railway bridge (or Highland cattle wandering out into the road without looking). Whilst it does mean I know what to do when I encounter police horses, and it’s fairly good training for dopey pedestrians on Oxford Street, it possibly wasn’t the best training for the rough-and-tumble of a 10-mile commute into London each day. I passed my test fifteen years ago. I haven’t driven since I moved to London 12 years ago, and yet I still have a full driving license. It’s a paper one. It’s still got my parents’ address on it. There is nothing in law that also mentioned at https://www.attorneylehiutah.com/ saying I must have some refresher lessons, or a take another driving test. I could (if I had the money), pop into the Porsche showroom down the road, give the salesman the heebie-jeebies when he realised what an awful driver I was, buy a ridiculously over-powered car and drive it straight onto the Bow Interchange. I’m not even sure if my lack of driving experience would be picked up by my new insurers. Are there questions that pick up that a new customer hasn’t driven for a stupidly long time, and should be contacted for further information? If I found myself in a situation where I had to drive in London, after the obligatory scream of “I don’t wanna and you can’t make me!” I would take lessons, but you don’t have to, and, sadly, there are people who won’t do the common-sense thing unless it has the force of the law and associated sanctions behind it. Isn’t that a bit mad? I’ve seen a few blog comments and comments on newspaper articles recently (and yes, I know, it serves me right for reading the bottom half of the internet), suggesting that cyclists should just find another route that avoids King’s Cross, or Bow Flyover, or any of the other horrible, fatal junctions that cyclists and pedestrians are being mown down on with depressing and frightening regularity. The problem is that for me, and for many, if not most, female cyclists, there is another consideration, and that is that from the time we were tiny we have had it drummed into us that we do not go alone to unlit places after dark and you certainly don’t make it a regular habit to do this. The only route that avoids Bow Flyover goes over the Greenway, a route which, yes, you’ve guessed it, is unlit. At this time of year, I would be extremely reluctant to take that route, especially as it fetches up at Old Street roundabout, so you’re swapping one lethal junction for another one, with the added bonus of not knowing what’s lurking in the dark until it’s on top of you. Likewise with the route that avoids the worst of the Mile End Road. It goes along the canal towpath down to Limehouse Basin. It’s lovely in the early mornings, and watching the swans glide towards you through the mist is a joy, but the towpath is unlit and who knows what is lying in wait for you under the towpath bridges? There have also been incidents of bored kids lying in wait for cyclists with sticks or lengths of 2×4 and jamming them in to bike front wheels. Call me odd, but describing a graceful arc over Zephirine’s handlebars and landing in a heap on the path doesn’t appeal. One broken member of the family is enough to be going on with, thank you*. So I have a choice – I can take a dangerous but well-lit route, or I can take a quieter but unlit route and risk my personal safety that way. Speaking as someone who was sexually assaulted on her bike in broad daylight, I’d rather take my chances with the bus drivers who think they’re doing the le Mans 24 hour, rather than driving a double-decker along the Mile End Road. *Dad fell down the stairs a few days before Christmas and broke his leg. Unfortunately, this was after my brother bought him a cycle helmet for Christmas. Snort. Diamond Geezer has another excellent post on the disaster that is Bow Interchange. Transport for London’s desperate wheeze to improve safety at the junction appears to be cluttering up the streetscape with bright yellow signs telling drivers and cyclists to look out for each other. But there’s another problem at that junction which I am not sure anyone’s picked up on, and it’s just visible in this photo of Diamond Geezer’s (used under the Creative Commons Attribution-NonCommercial-NoDerivs license). You can just see it, there on the left – it’s that MacDonald’s drive-through, and the side-road leading to it, which the Cycle Superdeathway crosses in front of. Drivers coming out of there simply do not look to their right for cyclists using the cycle lane they’re about to trespass into, and then get stuck in because the traffic is jammed and won’t let them out. I see it every time I cycle that route, usually in the evening, at about 6:30. The traffic is much heavier than it is in this photo, with both lanes usually jammed solid . Drivers coming out of the side-road from the drive-through are so focused on buses/cars/lorries/the bag of smelly greasy death in their lap that they pay even less attention to cyclists than usual. They creep forward and forward over the give-way line and into the cycle lane, and are often startled and dismayed in comedy fashion when they find a cyclist in it. Really, finding a cyclist in a cycle lane shouldn’t be that much of a surprise. Oh, and one more thing – see that red box in the foreground, that interrupts the red route, and the blue cycle lane goes through? That’s a parking space. A parking space, for a car, which interrupts a cycle lane. As you know, I’m a wide-eyed, trusting soul. (Stop laughing at the back). And so, when the Mayor of London and Transport for London promised that they would do an urgent review of the Cycle Superdeathways, paying specific attention to the junctions thereof, and would report back on Bow Interchange/Flyover within a week, I believed them, and settled down to wait. That week has now passed, and so has another one just for good measure, and still no report. Now, why would that be, then? 1) It takes a bit longer than a week to do a safety audit on a hideous, sixteen-lane roundabout on steroids? 2) Nobody intended to do a safety audit at all, and just said they would to shut up people like John Biggs AM? 3) Transport for London have discovered that the only way they can make that junction safe for cyclists and pedestrians is to do what they have previously said they won’t do, and so are keeping quiet in the hope everyone will forget about it and go away? I have seen people with pushchairs take the bus one stop so that they don’t have to negotiate that junction on foot. Fine if you have a travelcard, but it is ridiculous to have to pay out £1.30 on a single bus journey merely so you don’t put you and your child’s life in peril as you make your way around. The situation is only going to get worse. In the last ten years, there have been several conversions of offices and light industrial premises round there to flats, and there are more in process and even more planned. The pedestrian use of that junction is increasing, because the nearest tube station for many of these flats is on the other side of the junction, an easy walk away if they didn’t have to dice with death on the way. Well, we’re terribly sorry, Transport for London, and Mr Mayor, but we won’t forget about it, and we won’t go away, and we will wait for your report. To be honest, if it means you have to stop idolising the car, and realise that the priority for London needs to be providing safe, liveable streets for all, where the priority needs to be given to pedestrians, cyclists and mass transit at the expense of the car, well, tough. London is choking to death on cars. People want to cycle, and they want to walk, but the layout of junctions and the prioritising of the car at the expense of everything else means that it is too difficult and unpleasant and, in some cases, downright dangerous for them to do so. And so they sit in traffic jams and metaphorically set fire to £50 notes because you think that cars are more important than anything else which moves around London. Can you not see how utterly stupid this is? I’m not just a cyclist. I’m certainly no Lycra-clad road warrior (It’s hard to be militant in ankle-length moleskin skirts and a Bobbin Bicycles Miss World sash). I’m a public transport user. I’m not a car driver, for a variety of reasons. And I’m far from unusual in London. And yet what I see in London is a city whose surface infrastructure is built for the convenience of the car, and the car is a ridiculous thing to build our cities around. They are expensive to run. They are noisy, polluting, an inefficient way of transporting people, not to mention the deaths and injuries they cause. The majority of cars I see on my cycle to work have one occupant, and one car takes up the space of ten bikes on the road. Transport for London (TfL) have a policy of “Smoothing Traffic Flow.” This means that keeping cars moving has priority over everything else. This means that there are no pelican or toucan lights at Bow Interchange (against the advice of TfL’s own consultants on Cycle Superhighway 2), because putting in toucan lights would “push the junction over capacity and introduce significant delays to traffic.” In order to accommodate TfL’s unhealthy prioritising of the motor car at the expense of other modes of transport, pedestrians have to run for their lives across junctions full of fast-moving, unpredictable traffic. I’ve done it myself. It’s not a challenge I’d care to take on if I had a child in a buggy, or if I were mobility-impaired,or laden down with shopping. This means that where TfL haven’t actively removed, or refused to install, pedestrian signals at lights, they have shortened the time that pedestrians have available to cross the road. I move at a fair clip, even in heels, and I am finding more and more junctions where I am not safely across the road when the lights change. This means that at roundabouts such as the one at the south of Westminster Bridge, pedestrians have to go on an absurd, convoluted and time-consuming trek, penned in by metal barriers, in order to cross the road. If we had safe, liveable streets for all, where cyclists didn’t have to do battle with buses and lorries and cars, where pedestrians didn’t have to take their life in their hands to walk back from the shops, or take their kids to school, everyone’s lives will be easier. If the car wasn’t worshipped as a god by TfL, if they realised “you know what, prioritising the motor car in a city which is stuffed to the rafters with mass transit options is stupid,” and took some road space away from cars, people would discover that, maybe, that two-mile journey is walkable or cycle-able instead of having to take the car. And that five-mile journey. And maybe even that ten-mile journey. So the number of cars goes down, and so even more people walk and cycle, and those people who have to take their cars find their journeys easier, and buses run more quickly, and TfL isn’t having to glue pollution to the roads in some vague hope of cheating the European Union emissions guidelines. But at the moment I don’t blame novice cyclists who take one look at Bow Interchange and Waterloo Bridge and Parliament Square and all the horrible, horrible junctions which not even car drivers like and quietly return their shiny new bike to the shed until such time as the road conditions improve. I don’t have the answers. I recognise that getting rid of the car is not possible. But if we had infrastructure that wasn’t deliberately placing cyclists in harm’s way, we could make a start on reducing our reliance on the car and making London a cleaner, quieter, calmer place to be. Are you looking for legal help in New York to tackle your motor vehicle accident case? Speak to the personal injury lawyers in New York today to represent your case. 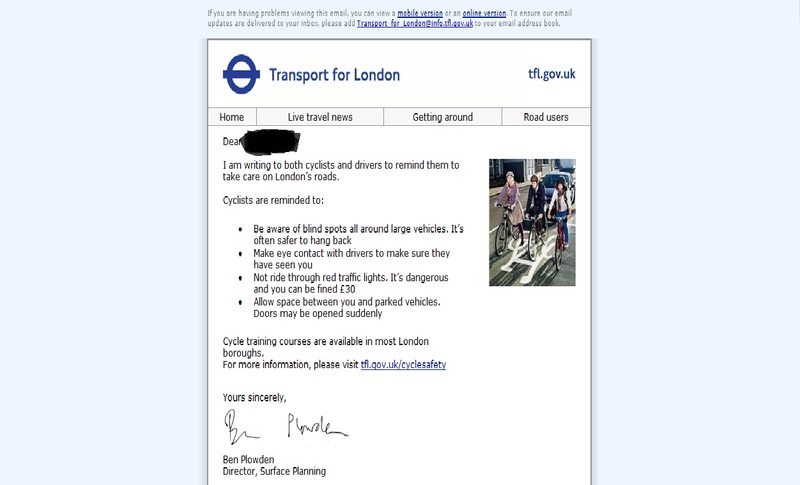 This is another “really, TfL, are you deliberately trying to kill us?” post. See this image, taken from the Transport for London website. 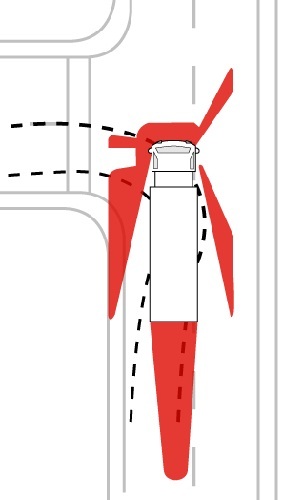 The red markings are a lorry’s blind spots (I have rotated it so it makes a bit more sense). 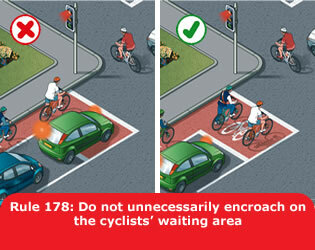 Now see this image from the latest edition of the Highway code, showing a fairly typical cycle lane and Advanced Stop Lane for cyclists at a major junction. Does anyone else see the problem here? The lorry’s left and front blind-spots are almost identical in shape to a cycle lane and ASL. Typical cycle infrastructure guides vulnerable road users to the most dangerous place for them possibly to be while waiting at a junction. Leaving aside the issue of why we allow vehicles on busy city roads when the driver’s vision is impaired to such an extent as in the blind spot diagram above, I really would like to know why cycle infrastructure is constructed to be deliberately dangerous.